SEOUL, South Korea–(BUSINESS WIRE)–Samsung Display announced today that the company will be supplying a 7-inch OLED display for Audi’s all-new electric Sports Utility Vehicle (SUV), the Audi e-tron®. Audi revealed its first all-electric model at a world premiere event in San Francisco last month. The Audi e-tron has attracted attention throughout the automotive industry. One of its highlights are optional* ‘virtual exterior mirrors’ – a ‘first’ for a volume-production car. As one of the most intriguing options on the vehicle, the virtual exterior mirrors feature ‘side view’ cameras, in place of conventional vehicular side mirrors. With these strategically located cameras, the driver of an Audi e-tron can check on what is happening outside in real time, without any delay, on Samsung’s most advanced OLED display, which is installed between a pillar on the inside edge of each windshield (the ‘A’ pillar) and the corresponding front door. The high-contrast OLED visual panels, supplied by Samsung Display, replace the function of conventional side mirrors for cars, with a driver-controllable camera installed at each side of the dashboard. A ‘touch function’ on the displays enables instant zooming of the screen’s image in or out when parking, turning or heading down the highway, in helping to optimize the field of vision for safer driving. Audi said that the wide view of the virtual exterior mirrors reduces the driver ‘blind spots'. Furthermore, the virtual exterior mirrors are able to secure a clear view even in dark cloudy weather. According to Audi, the virtual exterior mirrors also constitute an exceptional aerodynamic and visual achievement. 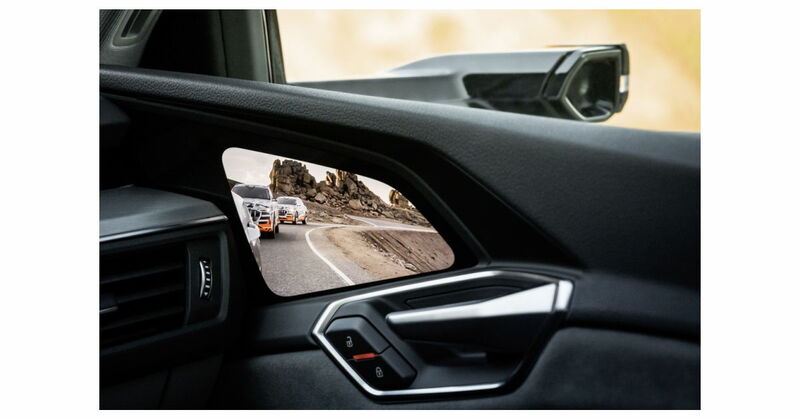 Compared with standard mirrors, the innovative virtual exterior mirrors are much narrower: They reduce the vehicle width by 5.9 inch (15 centimeters) and also noticeably reduce the already low wind noise. In the interior of the Audi e-tron, their images appear on the OLED displays between the instrument panel and doors. The images seen on the Samsung display that covers each virtual exterior mirror appear natural and distinct with none of the drag effects typically triggered by a slow response rate at low temperatures, while exhibiting outstanding color reproducibility. The Samsung 7-inch OLED display provides Audi e-tron drivers with an ideal visual solution, thanks to its low power consumption and innovatively thin, lightweight design, in addition to its superior imaging. Samsung Display said it subjects its leading OLED displays to ongoing research and rigorous development to optimize each advancement for the automotive market. Samsung Display is also supplying 5.7-inch OLED displays for back seat control of an array of climate control, seat, lighting, and media functions in Audi’s 4th generation A8, which was launched in 2017. At The Society for Information Display’s “Display Week 2018” conference and exhibition held in Los Angeles, CA this May, Samsung Display previewed a variety of OLED display prototypes such as a rollable-view CID (Center Information Display) console, an S-curved CID and an unbreakable steering wheel display, further advances that are expected to become part of the next wave of display components in future automobiles. * Editors’ Note: The optional virtual exterior mirrors for the Audi e-tron are not available in the U.S. at this time.